As can be seen in our description, the Beocenter 2200 was initially a tempting proposition but turned out to be a technical disappointment. Nevertheless, B&O decided to expand upon the theme with two new cassette-based models, the most important of which was the Beocenter 4000. Using the same model name as a previous music centre with elaborate cassette facilities, the Beocenter 4000 was somewhat different to what had gone before. Text copyright © Beocentral. Unauthorised reproduction prohibited. It can be argued that removing the turntable from the Beocenter 4000 reduced the “B&O content” to zero, but despite this it was still an interesting model. 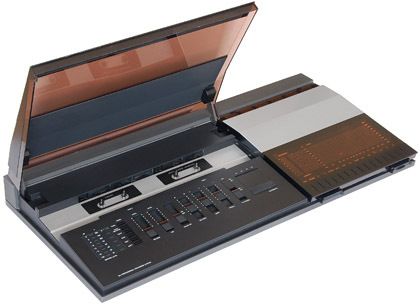 The most striking feature of the Beocenter 4000 was that it had two cassette mechanisms, one for recording or playback, and the other for playback only. At the time, double cassette decks were very popular, though they tended to be part of low-budget stereo systems or portable radio/cassette recorders, and were based around a common mechanism powered by a single motor. The B&O double cassette deck was a properly engineered piece of work, however, and used two totally independent cassette decks. Whist the playback-only deck was much the same as the one used in the Beocenter 2200 (and thus the rest of the more recent Beocord models in the range at the time), the recording deck introduced yet another new feature: auto reverse. This would soon become standard for all B&O cassette recorders, but the Beocenter 4000’s recording deck was the first. Not content with this, the designers also included the HX Pro headroom extension circuit in the recording deck, something that was not even fitted to the more expensive Beocenter 7700 or Beocord 2000. Text copyright © Beocentral. Unauthorised reproduction prohibited. Despite their popularity, double cassette decks were legally contentious in the UK at the time the Beocenter 4000 was launched. Amstrad (hardly in the same league) had ended up in court over the issue, and so to avoid trouble B&O printed legal warnings in their catalogues. The fuss surrounding cassette copying machines completely failed to notice that models such as the Beocenter 7000 and its derivatives had been capable of making near perfect copies of LPs onto cassette with equal ease for years, an oversight which is difficult to understand. Text copyright © Beocentral. Unauthorised reproduction prohibited. To complete the double cassette facility, various programming and sequencing options were included. Using these, one could copy from one deck to the other, play both sides of a tape automatically or repeat both sides of one tape and one side of the other. Both decks could use ferric, chrome or metal tapes and both functioned with Dolby B if required. Tape type selection was automatic. A final useful feature was that an external microphone could be connected, whose output could be mixed with any of the other sources and recorded. A sliding control set the microphone level. Text copyright © Beocentral. Unauthorised reproduction prohibited. The other parts of the Beocenter 4000 were much the same as those of the Beocenter 2200. The same radio tuner, with AM/FM coverage and four pre-set FM stations, along with the same 25W amplifier were fitted. A record player and compact disc player could both be connected, with the Beogram 3000 and CD X both being good choices. Text copyright © Beocentral. Unauthorised reproduction prohibited. In reality, the Beocenter 4000 was a better tape deck than it was a complete music system. When strangled by the poor amplifier and indifferent loudspeakers (a pair of Beovox X 25s were included) even the best cassette deck would not have been able to perform at its best. However, the Beocenter 4000 is worth remembering as B&O’s introduction to auto reverse, and its only double tape deck. Text copyright © Beocentral. Unauthorised reproduction prohibited.